Vic Reeves and Bob Mortimer has given us some of the wildest, most surreal comedy ever seen on British TV. 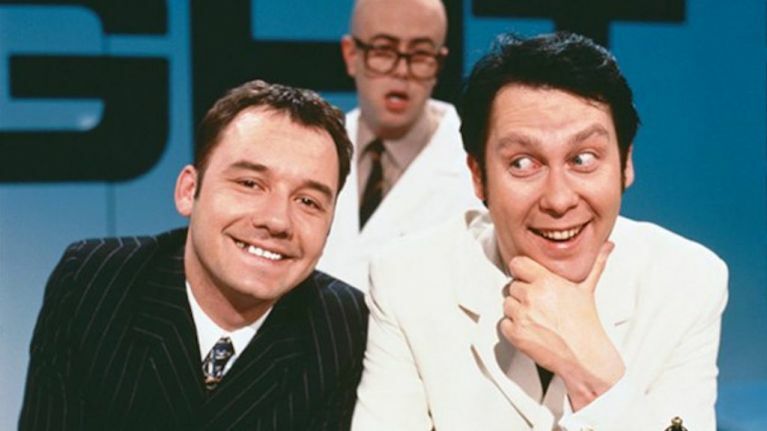 From Shooting Stars and The Smell of Reeves & Mortimer, to the more recent House of Fools, and the disgracefully-underrated Catterick (and Bob's brilliant bits on Would I Lie To You), Vic and Bob were doing the sort of weird comedy the internet before most millennials were even born. They first came to national attention all the way back in 1990, when the bizarre stage show Vic Reeve’s Big Night Out first aired on Channel 4, running for two series. Even by the standards of their later work, it still seems pretty strange – but at the time, no one had seen anything like it. Reeves would sit behind a desk cluttered with rubbish, while nonsensical characters would wander in and out to perform various skits. It was experimental, hilarious, brilliant, and hard to understand at points. The duo were soon poached by the BBC, where they’ve mostly stayed ever since. But tonight, 26 years after the last episode aired, Vic Reeve’s Big Night Out is returning for a one-off special. This time on BBC 2, the new episode promises appearances from beloved old characters like Les and The Man With The Stick, plus “sketches shot on location as well as songs, skits and stunts”, and “surprise cameo appearances”. Vic Reeve’s Big Night Out is on BBC 2 at 9pm tonight.